Is this the Nepalese Shane Warne? 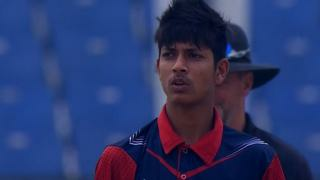 Nepal's Sandeep Lamichhane takes the Pakistan batsmen by surprise, producing some impressive turn that has seen him likened to retired Australian great Shane Warne. He finished the match with 3-53, but Pakistan picked up the win that sees them through to the U19 World Cup Play-off final.